Anthony Bailey takes us through the finer points of tablesaw technique, helping you cut those awkward shapes and tackle other common tablesaw problems. If we take the seat 'nose' (the front edge) this is awkward to shape as it is an assymetrical profile and is hard work doing all that by hand. 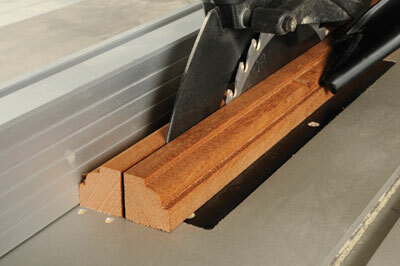 A solution is to use the tablesaw canting the blade at different angles to make each successive cut in turn. You need to mark the end profile with a template on both ends of the blank so you can choose which is the most practical end to do each cut from. Note that you must not remove the crown guard to do this operation as the blade is completely exposed. If you blade diameter is large enough this should not be a problem. 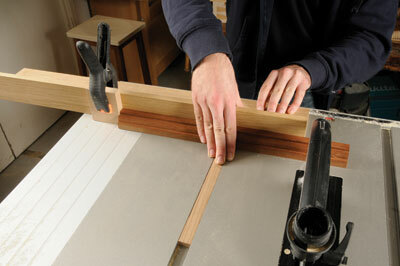 Most saw tables have a fence that can be slid forwards or backwards and then locked. There is a good reason for this, in the normal forward position it is fine for manufactured board as it is quite stable. You should of course have a fine tooth blade fitted first. However if you are cutting solid timber particularly hardwoods, then the fence should be withdrawn forwards preferably as far as the front edge of the rip blade, if not slightly more. This is because hardwoods particularly can 'spring' when cut as tensions in the wood are released and can trap the blade causing a kickback or pushing the cut offline. 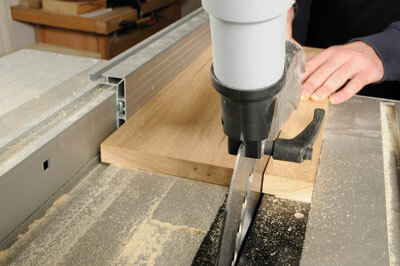 It can be tempting to saw and plane narrow strips ready for moulding on the router table. The problem here is that they will be hard to push safely over the cutter and vibration will cause 'chatter marks' (irregular machining and possibly burns as well. The solution is to plane a wide board and mould one or both edges, then saw these off to final width and repeat the moulding operation on the newly exposed edges, possibly planing them first for the best result. 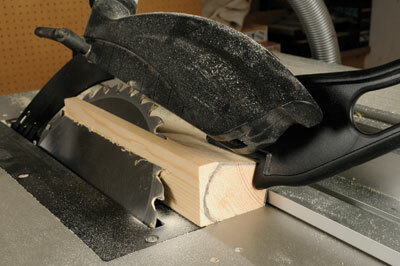 This ideally should be done with a proper crosscut blade as it gives a much better cut finish. If you lack a mitre fence or want an extended crosscutting fence you can make your own to run in the mitre slot in the table. It can either be a simple fixed 90 degree version or you could make a fully adjustable model for setting other angles. You can even clamp a length stop on it. The tablesaw offers a means of both rough and precise sawing of timber quickly and efficiently, depending on the blade used. Smaller machines are limited in capacity but larger machines may be able to process large panels and dimension stock to length when crosscutting. It is essential to have at least two different blades, a rip blade for fast cutting of timber and a crosscutting blade for more precise cuts especially across the grain of the timber. "Hardwoods can spring when cut as tensions in the wood are released"